29/01/2011 - Two new national records and another 22 titles were handed out at the ILT Velodrome today on the final day of the 2011 Southland Track Championships. The all round strength of track cycling in Southland was again apparent as riders spanning more than six decades rode in search of medals over a range of championship events. And it was the more “experience” riders who shone. 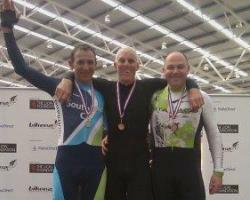 Veteran competitor Ray Robinson proved there is plenty of life left in his youthful legs, beating the Masters 3 (55 years and over) national record for the 2000 metre Individual Pursuit. Robinson’s time of 2’36.447 shaved 0.171 seconds off the mark set by Southland’s Bruce Jones in March last year. Ironically it was Jones who Robinson beat into second place today. Erin Criglington again showed she will be a force to be reckoned with at the upcoming Age Group Track Nationals by taking just under a second off her own National Record in the Women’s Masters 1 2000 metre Individual Pursuit. Other Southland Individual Pursuit champions for 2011 are Laura Heywood (Under 17 Girls), Josh Haggerty (Under 17 Boys), Sophie Williamson (Under 19 Women), Pieter Bulling (Under 19 Men), Jacqui Dearlove (Masters 2 Women), Simon Lusk (Masters 2 Men), Michael White (Masters 1 Men), Kylie Young (Elite Women) and Lee Evans (Elite Men). The Men’s and Women’s Open Keirin titles went the way of the form-book with Matt Archibald and Stephanie McKenzie controlling their finals to each bag another sprint title. Earlier in the day Liam Haggerty and Bronwyn Graham took out the Under 15 Derby golds. Points Race titles were also handed out across the age categories. Josh Carpenter and Bronwyn Graham took out the Under 15 golds while Jennifer Muhl broke Laura Heywood’s strangle-hold on titles in the Under 17 Girls, finishing strongly to earn a spot on the top of the podium. Meanwhile normal transmission resumed in the Under 17 boys with Michael Culling grabbing yet another Southland title. The Under 19 Points titles also went with the bookies favourites – Sophie Williamson and Pieter Bulling while the Elite champions are Sequoia Cooper and Lee Evans. The Southland squad to defend the National Points Shield at the upcoming National Champs at the ILT Velodrome will be named this week. The Elite Championships will be held from February 25th to 27th while the Age Group Champs follow from March 1st to 5th. Full results from the Southland Champs can be found here.